At approximately 1:00 pm today, the El Dorado County Sheriff’s Office was notified of a possible helicopter crash on the Rubicon Trail. Sheriff D’Agostini’s Deputies assigned to the trail patrol arrived on scene and verified a downed helicopter near the area of Buck Island Lake, which is approximately seven miles from Loon Lake. This area is only accessible by modified four-wheel drive vehicles, helicopters or hiking. There does not appear to be any fatalities, only injuries. We do not have confirmation of how many people on board the helicopter. Cal Star 6 is currently on scene and assessing any injuries. The FAA has been notified. More details will be available later in the day. 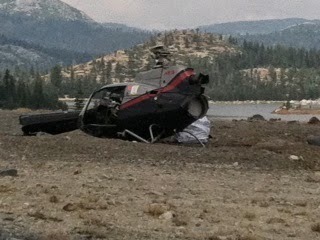 El Dorado County Sheriff’s Deputies on scene verified four people on board the downed helicopter. A male with head injuries and a male with leg injuries were flown to a Reno Hospital with what appeared to be non-life threatening injuries. The other two occupants walked away from the accident. The helicopter was assisting the annual Jeepers Jamboree event this weekend. At this time, the trail is closed and officers are standing by the wreckage. The NTSB and FAA are investigating the incident. Any questions related to the investigation should be directed to the NTSB and FAA. 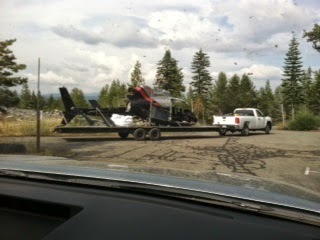 On friday august 1st on the Jeep Jamboree trip our contracted helicopter went down after take off from Buck Island. in good spirits and participants are coninuing to enjoy the 36th anual Jeep jamboree. 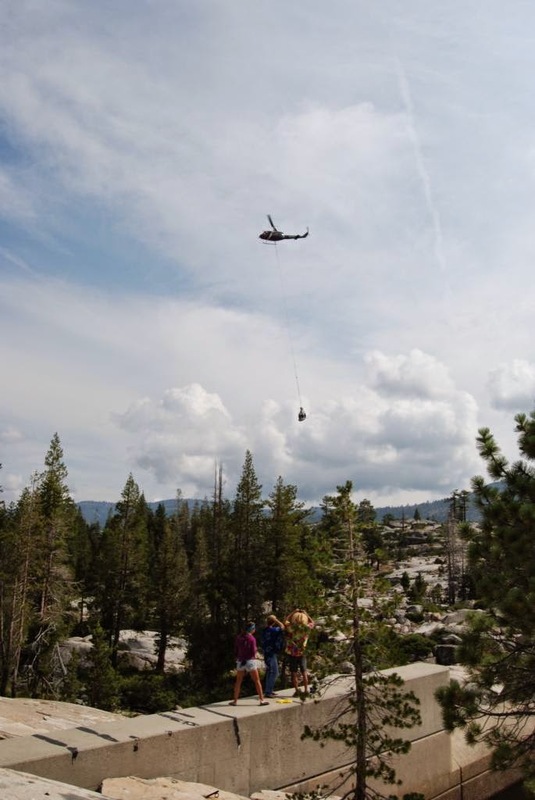 Reports of the crash and organization of the rescue were handled by Jeepers Jamboree's and Rubicon Trail Foundation's ham radio operators. This incident perfectly illustrates the importance of communications, especially when deep in the backcountry. The cellular phone service we're all accustomed to relying upon is unavailable on the Rubicon Trail. Satellite phones and Amateur radio (ham radio) are the primary means of communication here, and the video above briefly shows the 4-wheeler's "standard issue" Yaesu FT-60R handheld VHF/UHF ham radio transceiver. With a ham radio license (obtained through your local amateur radio club or through a class offered by the Rubicon Trail Foundation) trail users may freely access the Rubicon Repeater System to boost their 5-watt short range handheld transceiver into a long-range communications powerhouse. Even without a repeater system, a Yaesu FT8800R mobile transceiver's 50 watts is enough power to communicate from even the most remote backcountry locations. Citizen's Band AM radios (such as the 4-wheeler's common Midland 75-822 and Cobra 75WXST) and Family Radio Service FM walkie-talkies (such as these Midland and Motorola radio sets) have the advantage of low pricing and no requirement for an FCC radio license, but they only provide short-range vehicle-to-vehicle communications; they do not have the ability to reliably broadcast further than a mile. CB and FRS radios are no substitute for a proper ham radio. If you ever find yourself with a mechanical breakdown or personal injury in the backcountry, a ham radio may be your single most important survival tool. The NTSB has published their preliminary report on the crash after conducting their standard investigation. The report can be found here, the text of which is shared below. On August 1, 2014, about 1300 Pacific daylight time, an S.N.I.A.S. 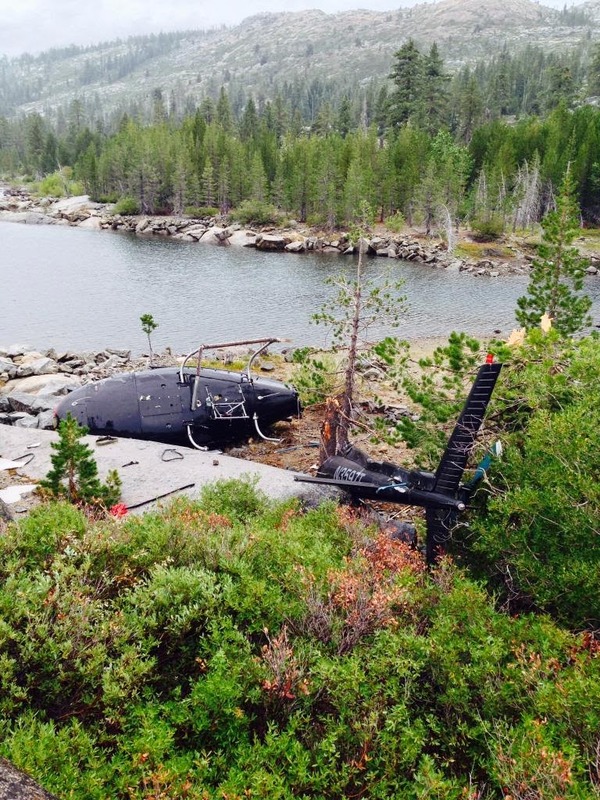 (Airbus Helicopters) AS350B, N3597T, collided with terrain on the shoreline of Buck Island Lake, near Tahoma, California. The helicopter was registered to, and operated by, Heli-Flite Inc. (dba Aris Helicopters), under the provisions of 14 Code of Federal Regulations Part 135. The airline transport pilot and one passenger sustained serious injuries; the remaining two passengers were not injured. 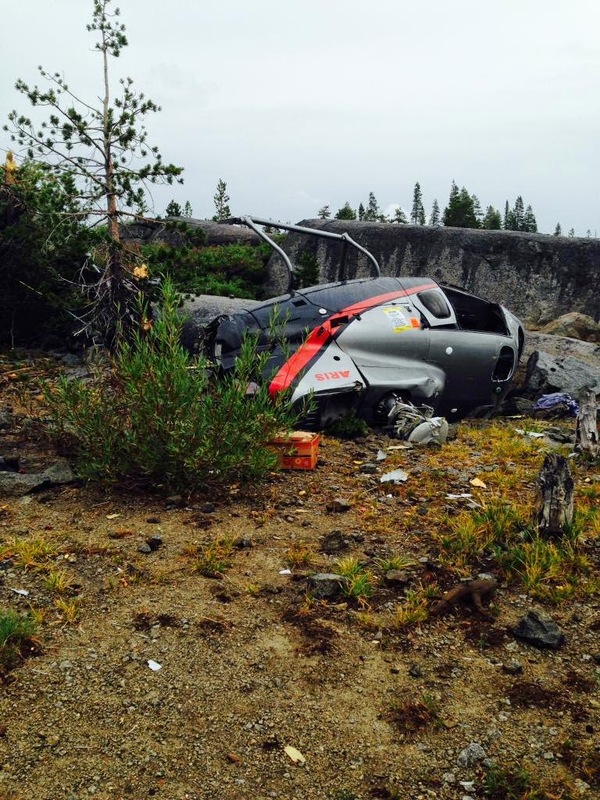 The helicopter sustained substantial damage during the accident sequence. The local flight departed from a helispot at Loon Lake, California, about 1255, with a planned destination of Buck Island Lake. Visual meteorological conditions prevailed, and a company flight plan had been filed. The helicopter was being utilized for transportation of both supplies and passengers (event organizers) for the Jeep and Jeepers Jamboree off-road events. The events took place along the Rubicon Trail during two adjoining weekends. The helicopter, pilot, and a fuel truck were provided by Heli-Flite, and were all utilized at the discretion of the event organizers. The helicopter and pilot had flown for the event the weekend prior. During that period multiple uneventful missions were completed transporting crew, as well as equipment and supplies under external load utilizing the helicopter's long-line. 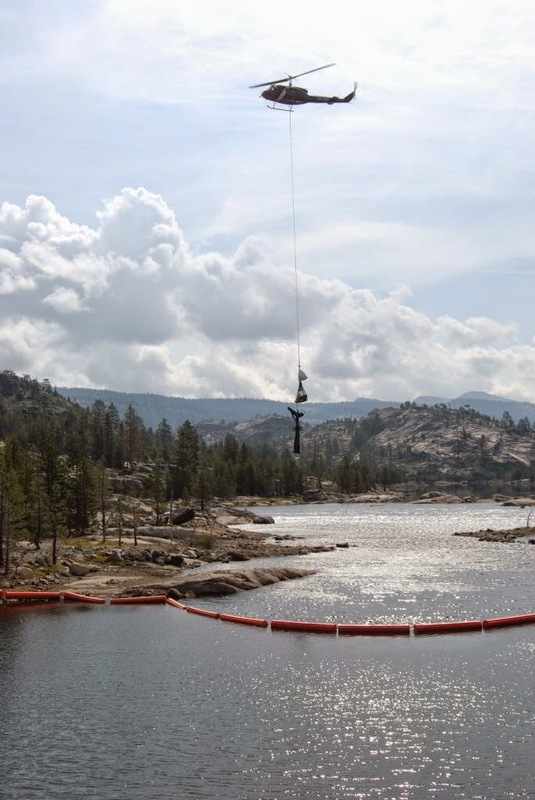 On the morning of the accident the pilot departed from the helicopter's temporary base in Placerville, California, and performed multiple crew repositioning flights to the Buck Island Lake area, as well transporting external loads from Loon Lake to Rubicon Springs. For the accident flight he departed from Loon Lake with three passengers on board, with the intention of picking up a fourth at Buck Island Lake. The inbound flight lasted about 3 minutes and was uneventful. The passenger being picked up observed the helicopter approach the landing spot over the lake from the south. The helicopter landed, and the passenger boarded. Once secure he gave the pilot the signal to depart, and the helicopter lifted into a hover about 20-30 feet off the ground. The passengers all recounted similar observations, stating that having attained a hover, the helicopter began a 180-degree turn to the south, and then proceeded to move forward. 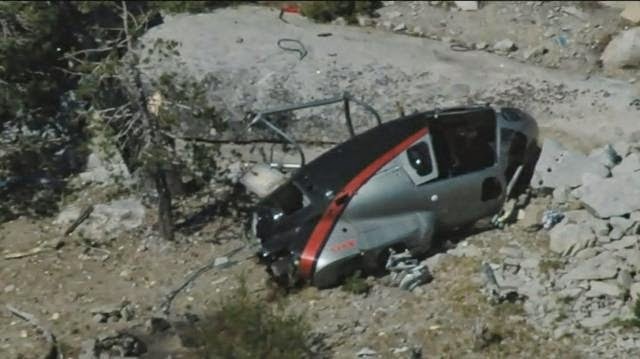 Rather than climb, the helicopter descended while still maintaining forward movement, crashing into trees and rocks south of the takeoff point. The accident site was located on the northwest shore of the lake, which was located within the confines of the Eldorado National Forest, 8 miles southwest of Tahoma. The primary wreckage consisted of the fuselage and tailboom, and was located on the lakeshore adjacent to the intersection of two concrete dam walls, at an elevation of 6,445 feet. Fragments of the main rotor blades were strewn around the site and into the adjoining lake. The farthest located component was a main rotor blade tip, which came to rest about 350 feet northeast. The remaining two blade tips were located in the immediate vicinity of the fuselage. All primary airframe components were accounted for at the accident site. The takeoff point was located on a flat rock slab in between the two dam walls. The main wreckage was located about 170 feet south, and 10 feet below the takeoff point. A series of cut trees were in line with the departure path, and all were cut at a height approximately level with the takeoff point.